Shelby will be four this summer, and Vicoria will be chronologically two in May. She acts two already. This post is NOT about spanking. I'm not going to tell you how to discipline your children. I was spanked growing up and when I think back on my few confinement periods I can absolutely see why my parents spanked me. I won't go as far as to say "I turned out fine" but I bet I turned out a lot better off than I would have if they hadn't spanked me. We have decided that for our family spanking is an acceptable consequence. Of course we hate doing it! It is not the only form of discipline in our home. We try to save it for serious offenses. If you have something negative to say about it feel free to contact me but I will not publish any comments regarding spanking (positive or negative) because frankly this is my blog and I don't want this post to turn into a debate. Nyah Nyah. Now that we have that out of the way! 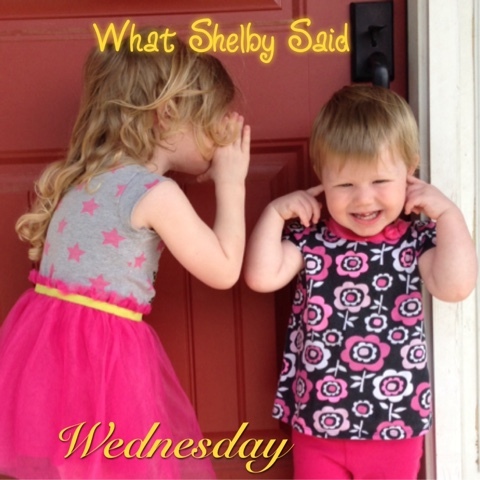 We are beginning to deal with some "Little Mommy" behavior from Shelby. Praise God, she has never acted it out. But she tries to determine for us when and for what Tori will be disciplined. Oh boy. Victoria (directed at Shelby): NO! No No NO no NO! (She does this, often with glee, much of the day lately). Shelby: The FIRST time you say NO at me again Mommy going to give you a SPANKIN. Oh boy. Or Shelby will seek me out to tell me something Tori has done and at the end will quip "You want to give her a spankin'?" No ... No my dear I am not going to spank your baby sister at your discretion based on hearsay. My very favorite time Shelby has ever brought up discipline, however, happened quite a while ago. My in-laws have a whip as part of their decor (What? It was a souvenir AND we do live in Texas). Shelby used to get ahold of it and drag it through their house hissing. Of course! It's a snake. She hasn't seen Indiana Jones, and she's never seen a whip in use so I have NO idea how she came up with this, but one day she called it "The snake of discipline." Giddy up, Move 'em out ... Discipline them doggies. Rawhide.